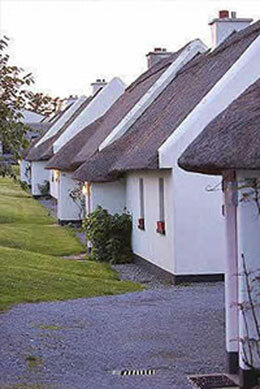 Nine traditional Irish Cottages situated in Tullycross village within ten minutes drive from uncrowded beaches; the finest fresh-water angling; sea fishing; golf, picnics on the islands dotted off the seashore; pony trekking and invigorating tramping through the plum coloured mountains of Connemara National Park. an all-electric kitchen and central heating throughout. The area has a variety of good shops, pubs and restaurants. Babysitting, cleaning and other optional services can be arranged. Cots on request. Washer/Dryers and colour T.V.'s. Pets welcome. 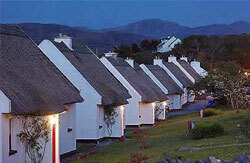 Renvyle Thatched Cottages, Tullycross, Renvyle, Co. Galway, Ireland.